One of my high school classmates told me, "You have to talk about the unspoken working mother--at home mother divide." This classmate starred in a couple of movies, then focused on raising kids, while staying behind the scenes and helping her husband's company in the entertainment industry. She said it's prevalent or conspicuous in her childrens' schools. Who's available to volunteer for the PTA, and who's not? Who donates money to the school and who logs hours? It's something I've noticed myself. There's this feeling--animosity might be too harsh a word--between the groups. The at-home moms assume the working moms feel tormented about leaving their children; yet we get the sense the working moms view us stay-at-home moms as a step above domestic servants, certainly as traitors to feminism, and above all, as idiots for ensnaring ourselves in financial dependency on our wage-earning spouses. Doth I project too much? On the other hand, if we ignore how much a child really needs to become a functioning concerned citizen, we diminish motherhood itself. Or parenthood. What no one is saying is that taking care of children is a full time job. Maybe it is true that mothers are "naturally" better; but isn't it possible that with so many families forced to have two wage earners, there is no one left to carry on the feminist fight? I mean, do you have time to march on Washington when every third day from the moment your children enters school until they're 7 or 8, one of them is home sick? and then you get sick? And then you have to go to work sick? I mean, if you have two or three children, you are physically depleted for a decade or more. Who's got the energy? Sure, I'd like to think the best thing for my kids is that I, Mommy, am here for them. I mean, whatever sense of accomplishment I can eke out from the mostly thankless work of raising children depends somewhat on that belief. If there's no way to even know if what I'm doing is going to turn out well, then, yes, I like to think that what I do is important. Which kind of puts me at odds with the moms who are working outside the home AND doing the mom stuff. I mean, by saying kids need their mom at home, what am I implicitly saying about moms who aren't there? I know one stay at home dad. Like me, he was a teacher and his spouse is a doctor. They needed someone to take care of their kids. He made less. He stayed home. Someone needs to be there for kids. They're more than afterthoughts, after all. They take a lot of creative energy and endurance to raise. Which is why I think we've run aground on progress towards equality. At least in part. So I'd like to bridge the divide. 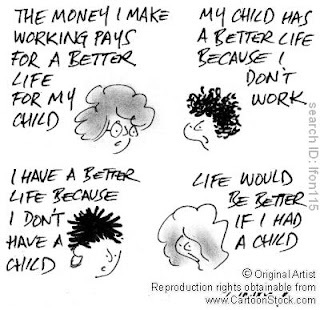 Wouldn't it be nice if every societal role involved with children were valued, because children were valued? I mean, if you choose to specialize in anything in medicine involving children, you will earn less than you would in that specialty treating adults. And teachers? Well, I value the hell out of them, but our message as a society certainly runs the other way. And don't even get me started on how we treat at-home moms. Or nannies. Or daycare teachers. Where do they rank on the ladder of respect? Wouldn't it be nice to be able to earn Social Security for all the years you spent lolling about on the divan eating bon-bons and, oh, right, raising the children? And I am totally open to the idea of dads being as good primary caregivers as moms. Just that not too many do it. And until someone can watch our kids, we can't get out to change that.